Pure carbon, but not something that is going to upset the greenies, or the skeptics. The hardest natural element known, it can only be scratched by other diamonds (a simplification, but good enough for our application). It is not the toughest substance known – good compared to other gemstones, but not as good compared to many engineering materials. However, it is this hardness that we are particularly interested in for tools – when sharpening, you are scratching the surface (which is where diamonds excel) with increasing finer grades, until a mirror polish is achieved. If a diamond does fracture, it reveals another facet, and continues to do what it does best. A diamond whetstone then is a powerful sharpening tool in the workshop. 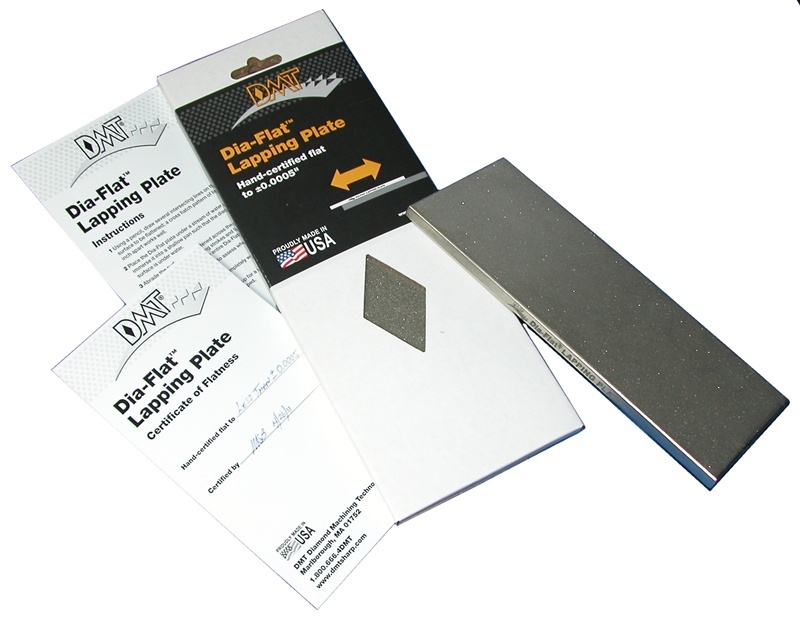 Unlike other sharpening surfaces, a diamond whetstone actually gets better with use. Cool huh! DMT are my preferred diamond product company – they have some innovative products, and use a serious manufacturing process which binds a quality diamond in a high concentration, with a very consistent diamond size – important in sharpening situations (you don’t want deep random scratches from a rogue diamond). From there, you get into the pastes (and not something I’ve tried), which comes in a 6 micron, 3 micron and 1 micron grade. They have DiaSharp stones, folding whetstones (plastic covers), Wavy plates (used to match the internal and external radius of curved tools, such as gouges, and the Aligner for kitchen and pocket knives (including serrated blades). Not everyone wants to use diamond for sharpening, and that is a perfectly acceptable perspective. I personally like the very soft, yielding surface of the japanese waterstone. Others are fans of oil stones, or Arkansas stones, or ceramics. All of these will wear unevenly because of what they are made from, and to get the sharpest surface, you need a flat sharpening surface. You might use the sandpaper technique – a piece mounted on a sheet of plate glass to produce a flat surface and rub the stone on that. Or another technique is to rub two stones together. But there is another solution, and it will be of no surprise, it is a DMT diamond solution. At 10″ x 4″, it is an uncompromising size – taking your entire favourite whetstone, and flattening the entire surface in one go. Check out this video by Stan Watson, the Technical Director for DMT on using the Dia-Flat to flatten a waterstone. Mine will be subjected to the ultimate flattening process shortly (most likely over the coming weekend) No more hollow sharpening stones for me!